While Malta was buzzing with activity, the Knights continued to fight at sea. In the meantime, the Turks soon reacquered their boldness and occupied Cyprus from where they could more easily threaten all the States situated along the coasts. A new threat gave Pope Pius V the opportunity to convince the King of Spain that the time had come for them to act resolutely against the Ottoman Empire. An alliance was established and included besides Spain, Venice, the Holy See, the Duke of Savoy, the Grand Duke of Tuscany, Genoa, the Kingdom of Sicily and the Order of St. John. The battle took place in the waters of Lepanto on October 17th 1571 and the Knights were led by the Prior of Messina, Fra' Pietro Giustiniani. The Hospitallers were there with only three galleys but numerous Knights fought on the Spanish, Sicilian, Pontifical and Tuscan ships. Don John of Austria, the brother of the Emperor of Spain, led the armada. Marcantonio Colonna led the ships of the Pope; Sebastian Veniero and Agostino Barbarigo those of Venice and Gianandrea Doria was the Admiral of the Genoese ships. A fleet named the 'Squadron of Adventurers" and armed at the personal expense of a few gentlemen who wished to take part in the undertaking joined the Christian forces. Don John of Austria entrusted this squadron to Count Don Vincenzo Marullo, a patrician from Messina, known for his valour and skill at sea, who also happened to be the owner of one of the best armed galleys. It was a bitter struggle with the Christian front relying upon 243 galleys while the Turks had 280. Admiral Ali and the Viceroy of Algeria, Uluch Ali, were at the command of the Turkish fleet. 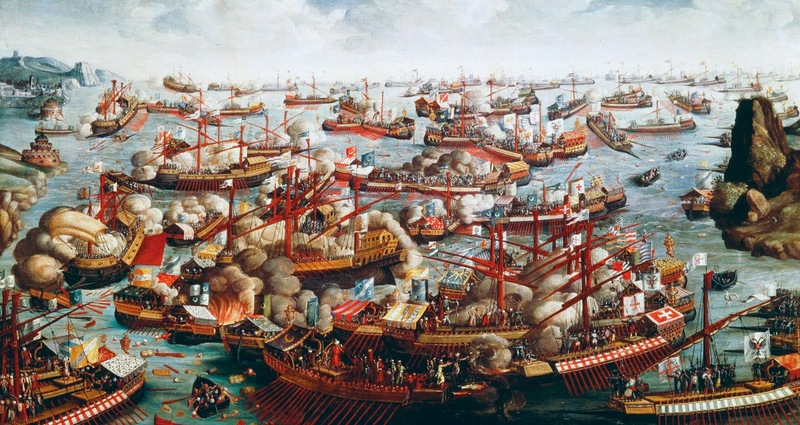 The Christian fleet surprised the enemy at sunrise and advanced according to the traditional order of battle: a long front, whose centre was led by John of Austria, the left wing led by Sebastiano Veniero and Barbarigo and the right one by Doria. In the centre as a reserve, was the squadron of the Marquis de Santa Cruz. Eight large galleys preceded the front and had the task of bearing the first assault. The Turkish fleet moved in only one line with neither reserve nor vanguard. The first stages of the battle were favourable for the Christian army but a mistake made by Doria risked compromising the final result of the battle. Fearing to be encircled by the galleys of Uluch Ali, the Genoese leader sailed out to open sea leaving the entire left wing unguarded, thereby creating an opening through which the Turkish Admiral and his fleet penetrated, investing the Christian centre defence which was already heavily engaged. The galleys of the Order succeeded in stopping them until the arrival of the reserves led by the Marquis de Santa Cruz, but only at the cost of heavy losses and the risk of being captured or sunk. The extent of the Muslim defeat was impressive: one hundred ships were captured and one hundred and thirty burnt or sunk. Twenty-five thousand men were killed and eight thousand captured and taken prisoner while ten thousand Christian slaves were set free. Fra' Pietro Giustiniani, Prior of Messina, returned to Malta on November 3rd, having been injured by five arrows and his ships marked by the heavy battle. He carried two ships with him as spoils of war as well as the joy of having contributed, on behalf of the Order of St. John, to another victorious day for the Christian Army. Europe exulted, but because of futile jealousies the alliance did not succeed in exploiting its success and shortly after it was dissolved. Cyprus remained in the hands of the Turks: this was a mistake that Venice and the Knights would later pay a high price for.